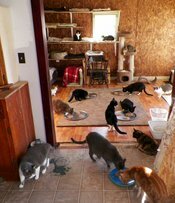 ​​ Saving ​Outlawed and ​Unwanted Lives, inc. is a no-kill, cage free facility for adult feral cats. It is located on a late 1800s, 5+ acre farmstead among the beautiful rolling hills of Chenango County In New York State. At SOUL cats are free to roam large, fenced in, outdoor areas where they have access to heated indoor rooms and many fully insulated outdoor shelters. Can I visit the sanctuary? No, the sanctuary is not open to the public. The sanctuary is located in and around my personal home and property, it is not a commercial building. The sanctuary is not open for visitation, it is not set up to accommodate human traffic. Please understand, this is "home" to feral cats, it is not a zoo where one can visit to admire the animals. Can I visit the cats I brought to you? No, visiting cats you brought to the sanctuary is not possible. I do understand some people are very attached to the cats they bring to the sanctuary, but once you place cats at SOUL, ownership of the cat(s) is transferred to SOUL. ​Do you adopt out your cats, or take in kittens? ​​ No, SOUL does not adopt out any of its residents. .
​ SOUL does not take in kittens as the sanctuary does not provide proper housing for little ones. Do I need to make a monetary donation to place cats at SOUL, and why? ​ ​Yes a non refundable donation of $3,000 (per cat) is required to place a cat at SOUL. SOUL runs entirely on public donations, the intake donation is to cover some of the cost of the care of the cat at SOUL. When I place cats at SOUL, will I receive regular updates? ​ Regular updates will not be sent automatically. However you may request an update via email or Facebook. ​Will I be notified if a cat gets sick and/or dies? ​ No, notification of illness or death will not be sent. ​If I change my mind, can I take the cat(s) back? ​ ​Than will depend on the situation. ​When I bring a cat to SOUL do I need to sign any paperwork? ​ Yes you will be required to sign a release agreement.